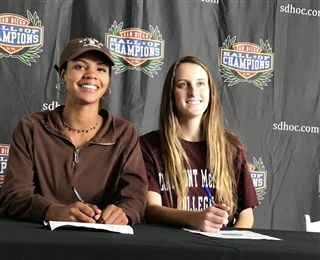 Jackie Jones '18 and Amira Parker '18, participated in the National Letter of Intent Day on November 8. Student-athletes throughout the county converged on Petco Park to announce where they will be playing sports at the collegiate level by signing a letter of intent. Next year, Jackie will be attending Claremont McKenna College where she will be playing volleyball, and Amira will be attending Brown University where she will continue with rowing.